We were saddened to hear that Anlly Paola Guzman passed away April 12th in Medellin in the early hours of the morning due to complications after surgery. The death of Paola, only 17 years old, was very sudden and unexpected. Her funeral was held in La Unión and hundreds of people attended the vigil and funeral. We are heartbroken by this loss, and frustrated by the various forms of State violence that continue to impact the lives of the Peace Community. 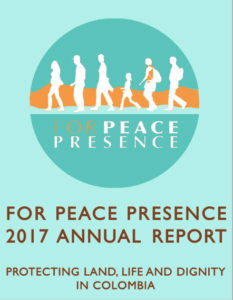 FOR Peace Presence turned 15 years old in 2017. Throughout these past years, we have learned valuable lessons, made lasting relationships with incredibly brave human rights defenders and grown as an organization. 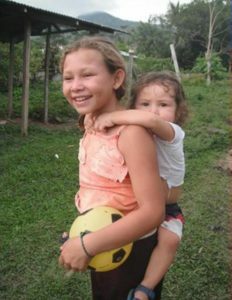 We are proud to remain committed to protecting land, life and dignity in Colombia, and providing protective accompaniment to some of the most at-risk and marginalized communities throughout the country. Our partners continue to be a source of inspiration for us on a daily basis. Their committment to peace has demonstrated the power that nonviolence and strong communities have to create real, lasting change for future generations in Colombia.